State lawmakers shouldn’t choose between paying dentists higher rates for treating Medicaid or licensing dental therapists. They should do both. 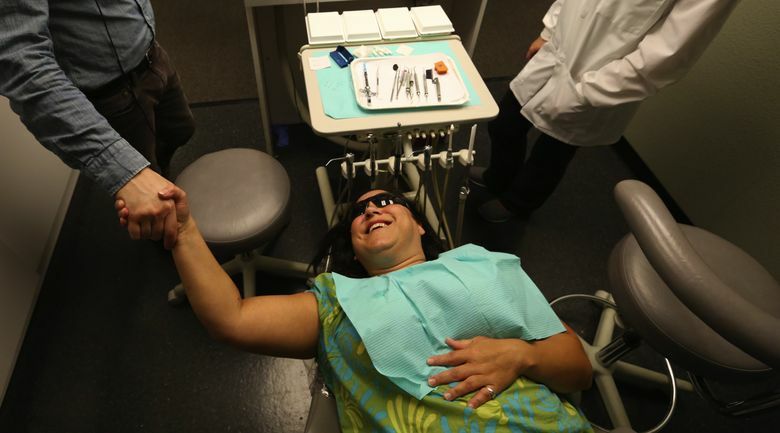 TOO many of Washington’s residents insured by Medicaid are not able to get the dental care they need, which endangers their general health as well. Seattle Times reporter Will Drabold recently detailed the challenges facing people with state benefits who can’t get in to see a dentist. For instance, Medicaid patient Natasha Fecteau of Bremerton was repeatedly turned down for care and had to have a molar, which could have been saved earlier, removed. Two simple things should be considered to improve the situation. The state could explore licensing dental therapists, who can provide limited basic services at a much lower cost than dentists. The other is to begin increasing Medicaid reimbursement rates, at least for certain patients, especially those at risk for costly health complications. Disappointingly, dentist groups have lobbied to prevent states from licensing dental therapists, who can perform such services as cleanings, fillings and pulling teeth. Meanwhile, some dentists refuse to serve Medicaid patients because they say the state reimbursement rate is too low. The state reimburses only about 29 percent of what dentists charge. When the state Legislature is struggling to adequately fund K-12 education, increasing funding for other programs is a tougher sell. However, in the long run, investing in preventive care could save millions. In 2014, the state spent more than $285 million on Medicaid reimbursements for dental care. Of that, about 21 percent, or $60 million, was for adult care. The Washington Dental Service Foundation, a nonprofit funded by insurer Delta Dental of Washington, recommends raising Medicaid rates for diabetic and pregnant patients — two high-risk populations more likely to suffer significant medical complications from untreated dental problems. The foundation estimates that raising reimbursement rates for those two groups would cost roughly $22.5 million from 2015 to 2019. But preventive services would save $31 million, resulting in a net state savings of $8.5 million. Minnesota, Maine and tribal communities in Alaska have begun allowing dental therapists, and other states are looking at licensing them. Bills authorizing dental therapists stalled in committees in Olympia last year. For more than a decade, a partnership between the Alaska Native Tribal Health Consortium and the University of Washington has trained about 50 dental therapists to provide routine care to more than 40,000 people who live in remote Alaskan villages. Dentists should view dental therapists as complementary, not as competitors, said Louis Fiset, curriculum coordinator for the UW program. Dental therapists must be supervised by dentists in a similar way that physician assistants are supervised by medical doctors. The use of dental therapists can make basic dental care more accessible to Medicaid patients and more affordable for people who are uninsured. More providers and improvements in Medicaid funding for necessary dental care could improve the quality of life for thousands of people and could save taxpayers money.